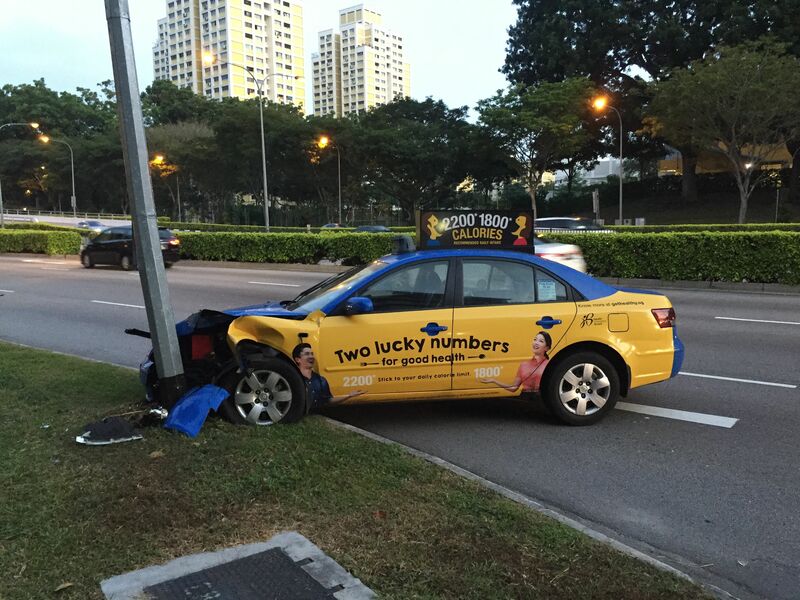 SINGAPORE - A taxi crashed into a street lamp along Braddell Road on Thursday (March 3) morning. The driver of the blue Comfort taxi and his male passenger were not injured in the crash, which happened outside the Singapore Press Holdings (SPH) News Centre. Security guard Simon Kiang, who was in the News Centre's guardhouse nearby, heard a loud "bang" at around 6.55am and ventured out to investigate. "The cab had knocked the lamp post slightly askew and there was debris from the damaged lamp strewn all across the three lanes of the road," said Mr Kiang, 48. "I tried my best to pick up the damaged bits so traffic could pass safely." The front left portion of the taxi was badly mangled, while a damaged part of the lamp was seen dangling precariously by a single wire. The taxi driver, who gave his name only as Mr Toh, said he had been distracted by the street lamp, which he claimed was not working at the time of the accident. He added that he was travelling at around 60kmh. Mr Toh also shared that he was the relief driver and had just ended his shift. He was sending his friend home nearby when the accident happened.